Written a series of books about Spoken Arabic (Levantine) using unique methods drawn from his experience. 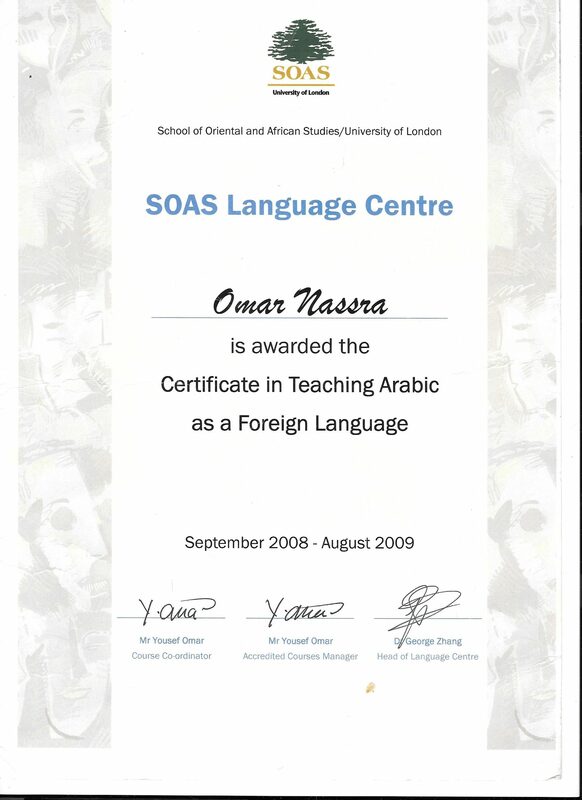 Obtained his Arabic teaching certificate (CTAFL) from SOAS University. Over 9 years experience teaching Spoken Arabic in Damascus and London. The Nassra Arabic Method is the only personalised, on-demand, and interactive online tool for learning spoken Arabic. It was created after a decade of research by Omar and Khaled Nassra. It has been tested on hundreds of our foreign students. It is the only online Arabic course where you are guaranteed to put your newly-acquired language skills into practice immediately. I can make you confident in Spoken Arabic within 5 months! Omar is the only teacher in the world who has developed a complete system for learning spoken Arabic dialects. The only Grammar book was ever written for Learning Levantine Arabic. 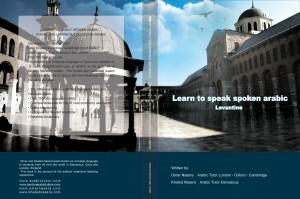 Discover The Best Way To Master Learning Spoken Arabic! Each student is different, with different needs, that requires a unique, custom coaching programme. Speak Arabic in hours, not in years. The Nassra Arabic Method is a proven and personalised approach to learning Arabic. 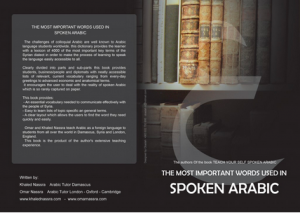 Grammar Spoken Arabic and The most important words used in spoken Arabic now available. MR Nassra only hires the most qualified experienced Arabic tutors in London. Nassra Team uses The Nassra Arabic Method Course in their teachings. Full Access to All Levels. Get your 7 Essential Arabic Lessons Now! Thank so much for the great lessons. The methods of teaching are absolutely fantastic as it is very efficient and enjoyable. I am confident that soon I will be able to speak Arabic with the family of my husband, who is Syrian. I am so grateful to finally have found such a great and patient teacher. I am also amazed that within only 3 lessons I am starting to talk a bit and understand some basic conversation! I would recommend London Arabic Tuition to anyone who wants to learn Arabic. Omar Nassra gave me twelve Arabic lessons in April – June 2014. I was a complete beginner. I found Omar an excellent teacher and achieved more in the limited time available to me than I had expected. I learned the alphabet, and am now able to read and write; we covered some basic grammar; I gained a reasonable vocabulary (perhaps 300 – 400 words) in areas relevant to my forthcoming job as Deputy Head of Mission at the British Embassy in Riyadh and to life there; and I feel I have an understanding of the way in which Arabic works – sentence construction etc. All in all, this should help considerably as I assimilate the culture in Saudi Arabia, and gives me sound framework for further study in-country. Omar was friendly, patient and clear, understanding my needs and pitching the lessons appropriately. I have no hesitation in recommending him as a teacher of Arabic. I should be happy to be contacted direct (wildash@tusker.co.uk) in case of need. I have been studying Arabic for 3 months with London Arabic Tuition and have found the teaching methods both effective and impressive. I would not hesitate for a moment to recommend London Arabic Tuition for anybody wanting to achieve proficiency in spoken and written Arabic and for those who wish to acquire a practical usage of a difficult language quickly. I am more than happy to give further details about my experience with London Arabic Tuition should anyone be interested. I started studying Levantine Arabic with London Arabic last month. As a complete beginner, I am amazed at how quickly I’ve been able to learn basic words and phrases and to read and write the alphabet. The style of teaching makes it easy and enjoyable for you to learn at your own pace. 9 Years In The Making!